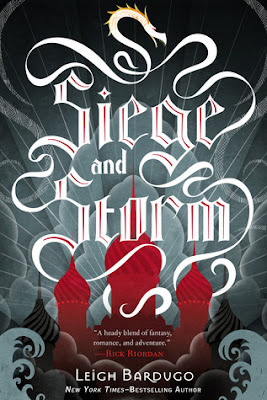 Okay so I didn't go into this one with too high of hopes because I wasn't a huge fan of Shadow and Bone, but I did enjoy this one more than I anticipated. I knew that Mal and Alina would be caught eventually, but I think it was stupid that it happened so quickly. I wanted her and Mal to have more time living in the slum before she was caught by the Darkling again. It is ridiculous that the Darkling can now make these shadow creatures even though it goes against the rules of magic that have been laid out for us. I liked the Darkling up until this new magical ability. He was annoying in his pursuit of Alina because I want him to have better motives than Alina being his companion and being able to rule in the Fold. I also think that Alina should have more conflict than whether or not to use her powers. I want her conflict to be whether or not she wants to rule with her powers. Honestly Mal is just meh to me. It is starting to become clearer to me that Alina shouldn't be with Mal and should be with a Grisha or someone who understands her powers and realizes that she needs to be able to use them. I wasn't a huge fan of Mal in the last book. I'm not a fan of people who don't realize the good things they have in front of them until they aren't there anymore. So. There's that. I don't think he is Alina's best choice for a love interest and I want her to just be in love with herself and her powers. I am glad though that she is using her powers more and testing their limits. I also like that just because Mal isn't okay with her having/using her powers that she isn't like, okay you are right I'm not going to do this, instead she is like, well too bad for you Mal. I didn't think that Sturmhund being the prince really made sense. It seemed like just a neat way to introduce him as a character and have the reader want to get to know more about him because he is now "interesting" since he has someone else doing his schooling while he is off being a privateer. I did like Nikolai (obviously) and I need to be exposed to him more. HOWEVER, I wasn't a fan of him taking unnecessary risks with his people. On the other hand, I did like that he was always looking to the future to be able to do bigger and better things. I like that it is moving quickly, but I almost feel like it is moving too quickly and because of that the world building is lacking. They are finding things so quickly then turning around and being like "oh we won't be able to find the third amplifier that quickly" when it literally took like a week to find the second one. I think it would have made more sense for all the amplifiers to take at least a month each but I guess for sake of moving the story forward that is being cut down. I'm also kind of bored of the Darkling almost dying at the end of the book only to not actually die. Either kill him off or don't have that type of conflict. I do like that each time this happens Alina expands on her powers though (even though it seems to almost kill her each time). Overall: 3.5/5 stars. The pacing was a little off to me and I thought the plot wasn't as strong as the first one. But I am really excited to see how this series concludes.